Login in to Linux Fedora Core Operating System. 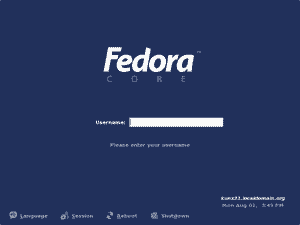 After completing the Fedora Core operating system installation, you will prompt to reboot your system and then you should see a login prompt on your monitor weather it is Graphical User Interface (GUI) or console mode (shell, text base log in interface). Every Linux system should have root user and at lease one non root user, this is because Linux is created as multiuser and multitasking operating system. The process of loggin in on Linux Fedora Core operating system basically requires the user to enter their user name and password before the Linux Fedora Core operating system fully loading up. This is one of the security futures that included in every operating system now days. The login procedures is the most basic security features to prevent unauthorized access (security breach or break in) to your computer. To loggin in or login on your Linux Fedora Core operating system, You can choose to login in on text base terminal (shell login) or in GUI by changing the terminal, using the key as shown below. 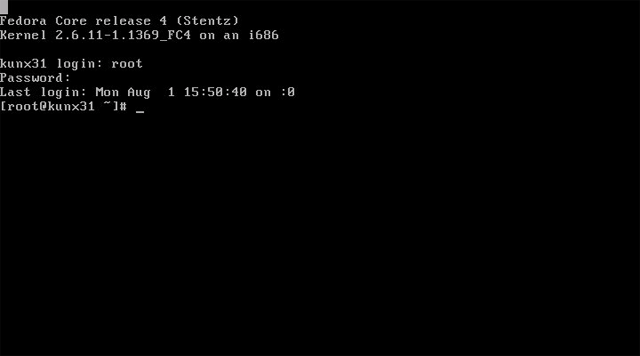 On Linux Fedora Core, you can use up to 6 text base terminal to log in to and to use the graphical login interface press ctrl + Alt + F7 key. 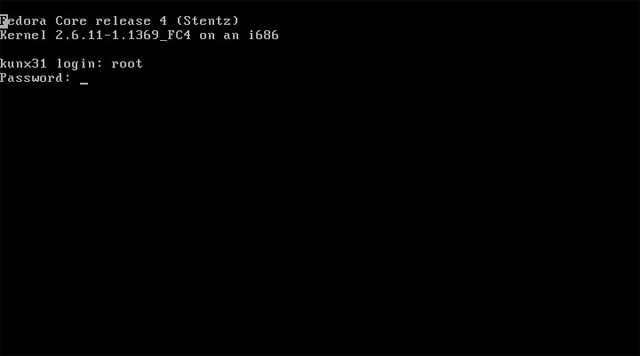 To start longin and use the shell interface choose one of the virtual terminal available by pressing the keyboard key. The example below show text base login interface on Fedora Core 4 operating system.. 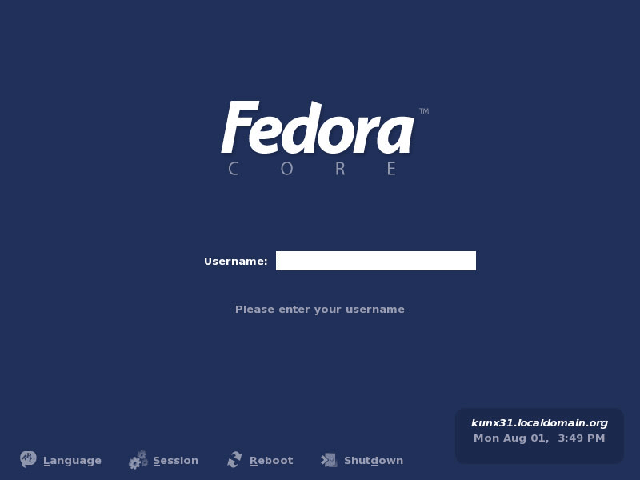 Step by step to login to fedora core operating system using the graphical interface (GUI). 1. Ctrl - Alt - F7 = Graphical User Interface (GUI) login. You can use the Graphical User Interface (GUI) to login by type in your user name and password. Type in your user name (which you create on the configuration setup) on Username box and hit the <Enter> key. 2. After user enter the user name and hit the <Enter> key, then key in the password for user account to log on. Type in the password of the user (which you create on the configuration setup) and hit the <Enter> key to start login to your user account. After you enter the user username and password (login), the graphical user interface GNOME or KDE workspace/desktop (base on your configuration setup) of Fedora Core 4 can be seen. 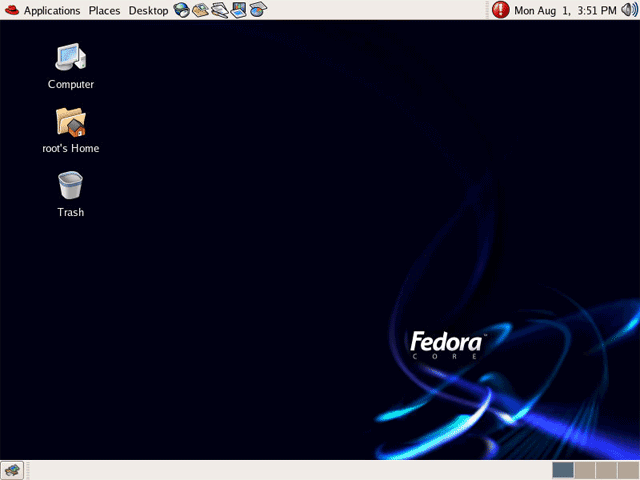 BACK: Configure Fedora Core 4 after the first boot. NEXT: Logout Reboot and Shutdown Linux Fedora Core operating system. Keywords: log in screen shot, step by step to login, login procedure, login in linux, login fedora, log in fedora core, text base login, login screen, fedora login screen, log in screenshot.